lol the cockatiel was playing hide and seek! Love it – I expect you're having as much fun getting it down as I am currently trying to get my cat out from behind our dvd players. They do like their freedom. 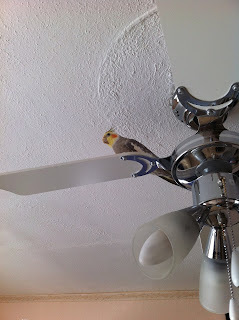 It's my sisters bird… so I left her to get him down! Aw, we had a cockatiel when we were younger – he was great! Super shot.